My little neighbor was scared, something had actually flew on him, he suggested roaches but they don’t fly. He was so curious he asked, “do roaches fly?” – yes! Roaches are peaky creatures usually characterized by dirt, filth and its ability to spread certain diseases such as salmonella, which is known to triggers asthma.Do you know that not all roaches are pests? about 4000 species of roaches exist today and only 1% (30) of the species are considered pests. You probably haven’t given it a thought or perhaps wasn’t certain if these crawling roaches do fly. It might seem a little awkward to know that the answer to your question – do cockroaches fly? – is yes! However, only a few species of roaches actually have wings. Some roaches have the ability to glide from one location to the other, they glide only for a very short duration. It appears to be bad fliers. On the other hand, a majority of the known species of cockroach actually crawl. Which is why you were amazed seeing a flying roach. These species of roaches are the most common species and they are peridomestic. They are shiny and reddish brown in color. 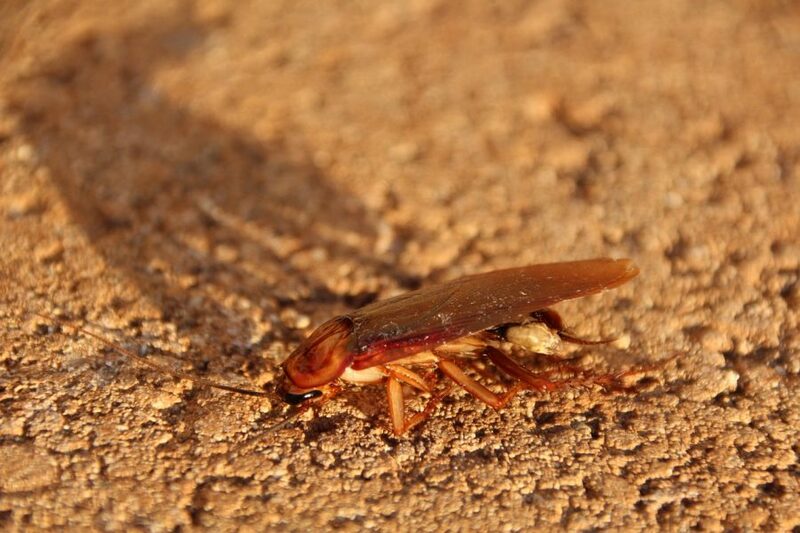 Basically, American roaches live and feed outdoors, however, when outdoor’s conditions become severe they are forced to move indoors. And when it comes to a more specific question, can American cockroaches fly? The answer is, yes, they do. The species of roaches are easily mistaken for American roaches, however, Australian Cockroaches are quite smaller compared to American roaches. It’s black with yellow stripes close to its wings. This is another large species similar to American roaches but easily differentiate by its evenly dark brown–mahogany coloration. They are found indoors only when there need for food, heat and a chance to survive. However, on warm weather, you mainly get to see them outdoors only. They don’t at all. Nymphs are like baby roaches, although they have the same physical appearance but differ in their size. Baby roaches are smaller to the adults. Nymphs during this stage have not grown or have their wing fully grown to provide them with flight. Now, here is the point you wonder how come these annoying crawling insects fly? Roaches are designed with two wings, a thick and a thin wing. Although only one of these wings is used to achieve flight. The thick wings are located in front and it serves as a shield or a protective casting. It’s not easily visible to the eye because it has the same color as the body and it always at rest on its back when not in use. The thin, clear, membranous wing lies underneath the think wings. It is these wings that actually give cockroaches flights. For a Roach to achieve flight, the thick wings must be lifted by the flying cockroach which leaves the thin wings uncovered and exposed. The thick wings remain lifted while the thin wings are used to make locomotion via air. Why Some Cockroaches Never Fly? After reading how roaches fly, this leaves you with the thought why do other roaches not fly likewise. Explicitly, most cockroaches that fly, do so by their ability to glide from a point to another. Although, it occurs shortly unlike birds or other flying insects. Flying cockroaches do so because they find gliding more efficient and time-saving when compared with crawling. There is where there difficult lies when flying. Cockroaches can only make use of a set of wings to move through the air. Now, imagine, a big cockroach trying to fly with a thin, membranous set wing, you can see it’s going to be difficult. Cockroaches have 6 strong legs, instead of being faced with the difficulty of traveling with a set of thin wings, they crawl. Their legs are strong and carry them as far as 50 body length in a second. Do roaches fly? Next time you hear that you should probably know the best way to answer, is it a yes or no? I guess it’s more than a simple answer.